You spend a lot of time on your mattress, so when you find a yellow stain, you likely want it gone. Sweat, body oils or urine are the likely causes of a yellow stain. Mattress stains must be removed carefully so you don't spread the spot further or saturate the inside of the mattress, which can lead to mold. 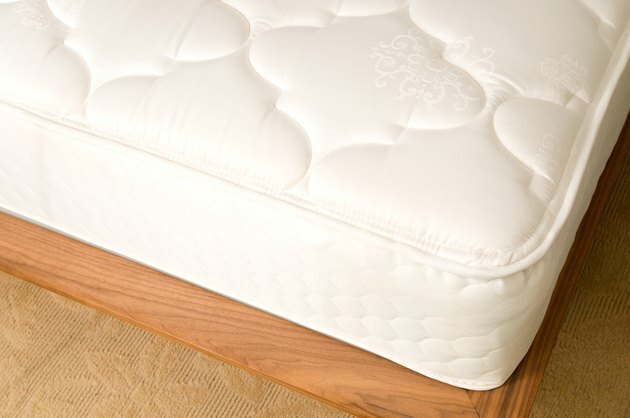 Clean mattress stains promptly so they don't soak in. Blot as much of the stain as possible with a towel if the stain is fresh. Continue blotting, switching to a dry part of the towel often, until liquid is no longer being absorbed. Fill a bucket with ½ gallon cool water. Add a generous squirt of grease-cutting dish soap. Mix up the soap and water vigorously with a whisk until thick suds form. Scoop the suds from the bucket with a clean, damp cloth. Try to only get the suds and as little water as possible. Rub the suds in a circular motion over the yellow stain. Blot with a dry cloth to absorb the moisture. Alternate scrubbing with the soap suds and blotting with a dry cloth until the stain is gone. Fill an empty spray bottle with hydrogen peroxide if the stain is still there. Mist the yellow spot with the peroxide. Let the peroxide sit on the stain for five minutes. Blot with a dry cloth to absorb the liquid. Alternate spritizing with peroxide and blotting with the dry cloth until the stain disappears.